It is often a confounding moment when a performance of free improvised or experimental music starts or ends. A few seconds of silent hesitation denote the audience’s anticipation, is it time for applause or for more listening? In light of these frequent occurrences, musicians tend to take on a more relaxed body posture and less concentrated facial expressions to mark the end of a performance, often with a smile as if to say: “Yes, you can now applaud, boo, do what you want, it’s over”.. Since its inception in 2000, the Irtijal festival (Irtijal literally meaning improvisation in Arabic) has garnered an impressive record of both local and international talents, evolving and fine-tuning along with its ever-growing and changing local audience. Taking place every April, Irtijal aims to create a platform for musicians, sound artists and others to play, jam and experiment musically in a city where free experimental music is not only a rarity, but also something of an oddity to most listeners. This year’s very special tenth anniversary edition highlighted prominent performers in free and experimental music from Europe and Lebanon with Franz Hautzinger, Paul Wenninger, vocalist Sabina Meyer and Axel Dörner, Uriel Barthélémi from France in addition to habitual musicians, Irtijal organizers and musicians, Sharif Sehnaoui and Mazen Kerbaj along with Raed Yassin, post-punk band the Scrambled Eggs as well as Court-Circuit, who were the newest addition to the array of improvisers. But the festival also highlighted an interesting turn in its increasingly diversified program, and proved successful in reeling in a wider, more eclectic audience. During Prelude to Irtijal, two nights prior to the opening of the festival, the organizers hinted at this shift through a range of musicians, including Japanese turntable talent DJ Sniff, French duo EVOLUTION and Canadian/Lebanese group Jerusalem In My Heart. Among the guests was prominent trumpet player Axel Dörner who played, blew, paced and performed his way through his three appearances on stage in, heterogeneous performances with remarkable constancy. There was also the local audience’s seemingly favorite electronic musician Tarek Atoui, who invited his long-time collaborator, French drummer and electro-acoustic musician Uriel Barthélémi. The duo proceeded to hurl out a continuously loud, motional performance, captivating the audience as they strummed and gesticulated an awe-inspiring electro-acoustic set fueled by Barthélémi’s violent pounding, while Atoui was creating an encapsulating soundscape behind his set of computerized, electronic and sensorial machines. Trumpet player Franz Hautzinger, who has previously played in previous editions of Irtijal, appeared this year with his Oriental Space project, which was formed in 2003 and includes Iritjal’s founders and musicians Mazen Kerbaj and Sharif Sehnaoui. This year, Hautzinger also took the stage with dancer Paul Wenninger for a duo performance at the Beirut Art Centre, which took the performative components of improvised music and dance to their apex, investigating sound but also movement within a delimited space with no clear guidelines as to how and why they interact. Though it may have been a coincidence, there seemed to be a particular, binding element connecting the Beirut Art Centre performances (starting with Hautzinger and Wenninger, Axel Dörner, with dancer Takako Suzuki and Raed Yassin on double-bass, and ending with Atoui and Barthélémi). Two of the three included dance and had a range of different props (like duck tape, paper, lamps etc…) the musicians utilized freely to emit sounds, delimit space, exploiting their potential usage in body and sonic movements. 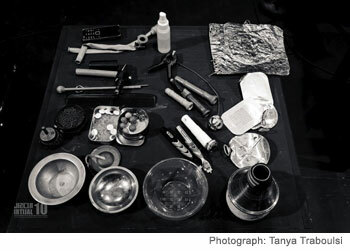 All props, seemingly exterior elements to the musicians themselves, were gradually stacked and piled up in a corner, duck taped or wrapped in cloth as if physically encapsulating the sounds, packed up to mark the end of the piece, reminding us of the ephemeral and experiential nature of the performance. One of the most remarkable elements of the festival was the multiple instrumentation of free, experimental music, leading to a delicious discovery of various instruments’ rich and unexpected potential sounds. The almost endless possibilities of vocal and “throat” gestures where the larynx becomes the instrument of choice, whether it is plugged into electronics (literally onto Helge Hinteregger’s throat), or unplugged, such as Sabina Meyer’s powerful control of vocal modulations, with squeaks and grunts changing both modes of delivery and meaning. The most noticeable vocalized show, which was a welcome change from the relative ‘stillness‘ that other experimental music demanded of the audience, was delivered by The EX. Formed as a four-piece band in the Netherlands in 1979 during the rise of punk, The EX is a difficult band to categorize. 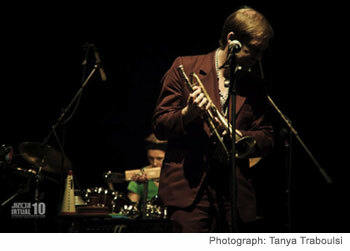 They have absorbed and appropriated many different musical trends and genres including experimental and improvised music, noise, and punk rock, in addition to numerous multifaceted collaborations with the likes of Ethiopian saxophone player Getatchew Mekuria and composer and cellist Tom Cora to name a few. For their highly anticipated gig in Beirut, the band shambled the intimate confines of the Beirut Theatre into post-punk madness. Having very recently released two singles (Maybe I Was The Pilot/Our Leaky Homes Single), the EX’s carte blanche proved to be quite a delightful, ever-flowing set as musicians took turns on the stage, in the form of pre-fixed trios, quartets, quintets and a solo by the entertaining lead singer, Arnold de Boer (who showcased some of his songs with band ZEA). For this year’s 10th anniversary edition, Irtijal’s line-up clearly manifested a growing desire to reinvent the somewhat demanding terrain of experimental music and noise, demonstrating that it can be done and undone, all the while remaining ‘accessible’ to a wider range of musical tastes and affinities. This year seemed dedicated to a broader audience of patient but passionate listeners prepared for the delicious moment of silent hesitation before they clap. Rayya Badran is a writer based in Beirut. Her interest range from the performative nature of the voice, the characteristics of aurality and music in film and video to melancholy in music. Her first publication entitled Radiophonic Voice(s) (2010) was produced in the framework of Ashkal Alwan’s Homeworks 5 Forum on Cultural Practices in Beirut, and deals with two radiophonic events recorded and filmed in 2006 during the Israeli war on Lebanon.